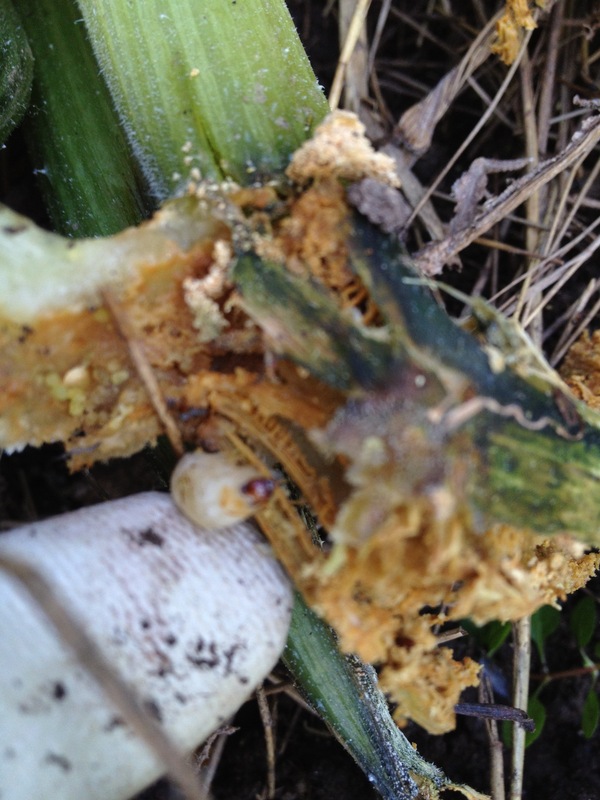 The dreaded squash vine borer! Right before leaving for vacation, my two zucchini plants were thriving and we were harvesting zucchini daily. Thinking I’d whip up a zucchini risotto for dinner the night we got back into town, I headed out to the garden only to find the plants half-dead, with two mini zucchini withering on the vine. The sawdust-like stuff around the base of the plants (frass) was a sure sign that this was the work of the squash vine borer. Immediate surgery would be required to save the plants! 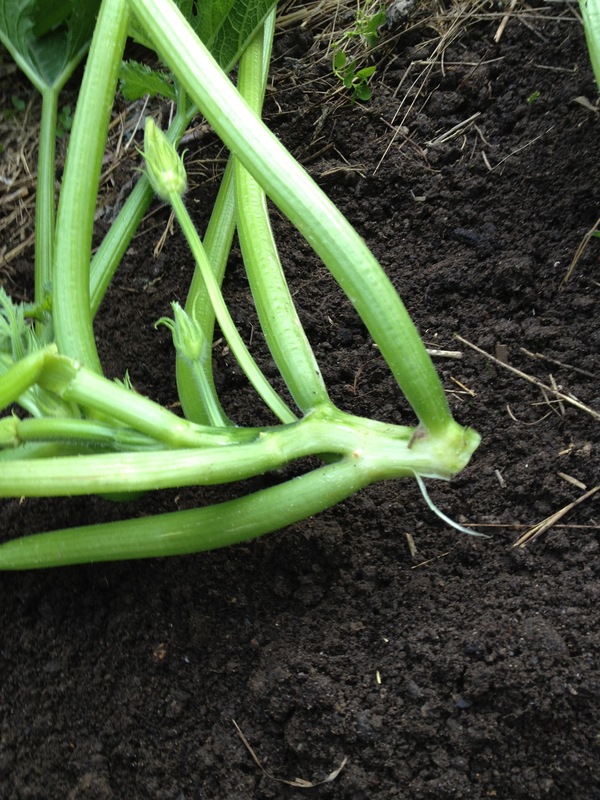 Remove the plants from the soil (the stalks practically disintegrate as you do this.) Search up the stalk for the last bit of frass and then cut through the stalk above it. 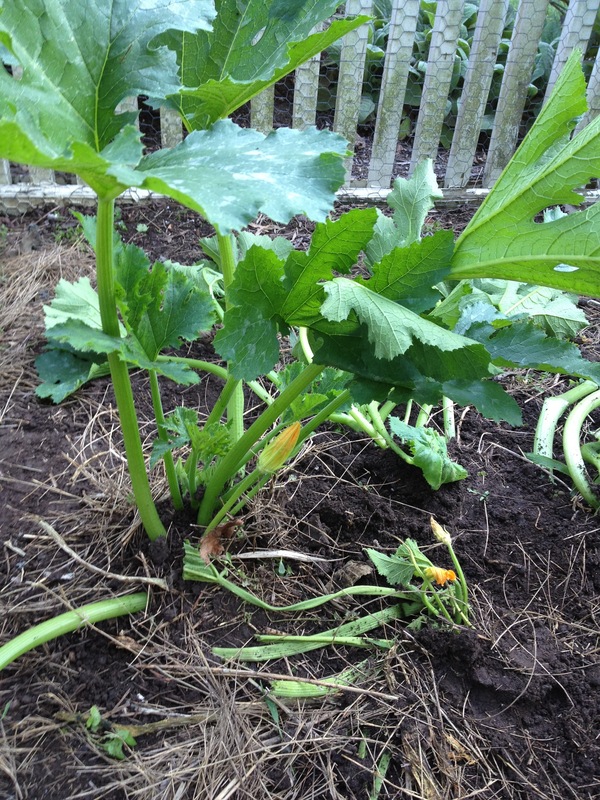 This seems draconian, but zucchini plants are tenacious and what’s left of the stalks will re-root if buried in soil. Now for the fun part! 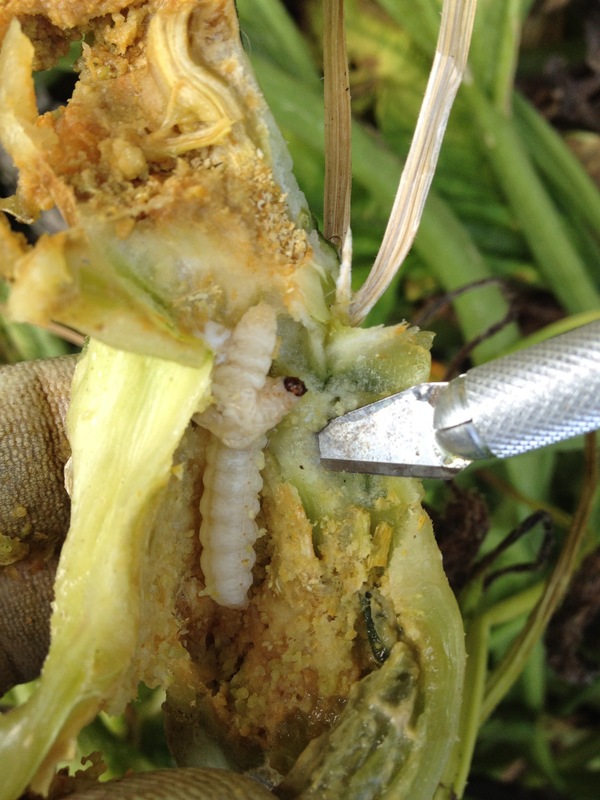 Using a knife, slit open the frassed-up stalks and search for the ugly, gluttonous vine borer caterpillars which are eating your squash plants from the inside and strangling them. Squish them all! (There can be several per stalk, so don’t stop at the first one you see.) You don’t want to give them a chance to overwinter in your garden. Throw away all the damaged plant material. Cover the base of the remaining healthy plant with soil and then water well. The plant may look withered for a day or two, but it should recover quickly as the stalk grows new roots. I hope to be posting zucchini recipes soon! 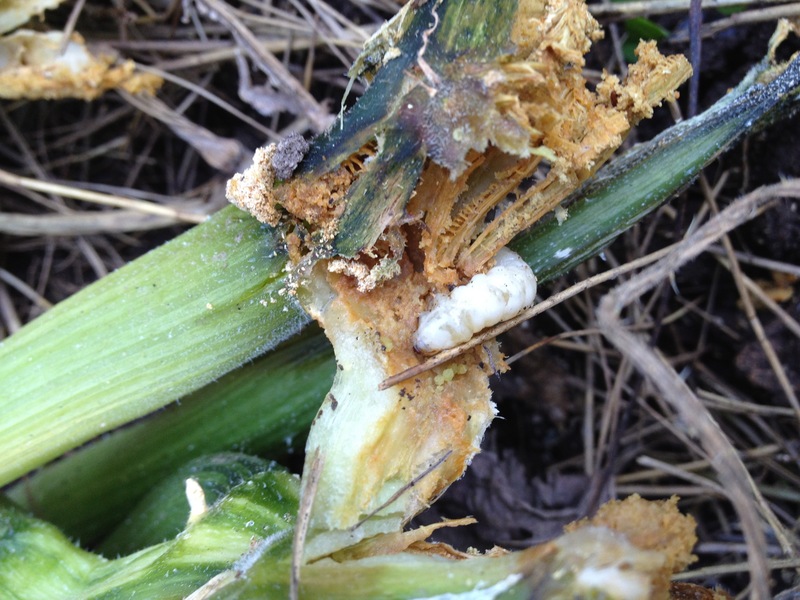 This entry was posted in Gardening and tagged gardening, growing zucchini, squash vine borer, zucchini by subeeskitchen. Bookmark the permalink. Amazing how a plant can recover! Looks like you will have your zucchini in no time. oh goodness, I didn’t know that’s what the problem was! thanks for teaching me how to deal with this. may be too late this year for me………. So glad this post concluded with triumph. Those little bastards almost took out our zukes as well! Well-done.